Earn $10.95 in VIP credit (1095 points)What's This? Shimano's SW-M8050 Right Shifter can control one or both derailleurs on XT Di2 electronic mountain groupsets. 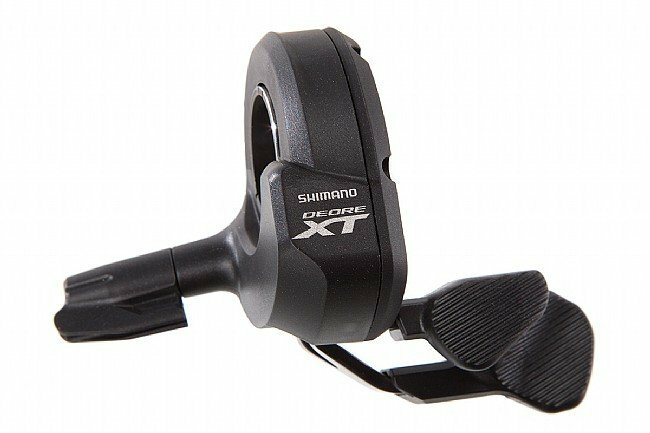 Its short lever throw and tactile button-feel provide instant and responsive shifts, and because it's all electronic, Shimano was able to maximize ergonomic comfort without the constraints of mechanical internals. Each lever can be adjusted in length for the perfect fit for any size hand, and XT Di2's E-Tube customization allows for upshifting or downshifting to be assigned to either lever, as well as front / rear derailleur operation or both when used with Shimano's 2 x 11 Synchro Shift option.